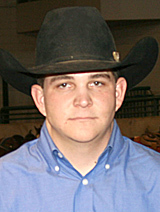 Cody Hedlund, Lipan, Tex., owned the Ike Hamilton Non-Pro Derby and Classic championships with 221 and 225-point wins, respectively, on Wood Ya Teles and Teles One Time. With money also earned as winner of the non-working Classic Non-Pro Gelding and Derby Non-Pro Novice divisions, Hedlund realized a total payout of $23,818. Including the Ike Derby and Classic championships, Hedlund, an NCHA Non-Pro Hall of Fame earner of $901,565, has a record of 15 limited age event working wins. In addition to Wood Ya Teles $20,914, by Woody Be Tuff, and Teles One Time $60,843, by One Time Royalty, Hedlund’s limited age champs include Meteles Cat $433.565, by Metallic Cat, and Teles Bout this Cat $230,047, by WR This Cats Smart, who are all descendants of a 1998 daughter of Lenas Telesis, Teles Lies, who Cody’s father, Rock Hedlund trained and showed to earn $93,206. Wood Ya Teles is out of Teles Bout This Cat, winner of the 2011 NCHA Super Stakes Non-Pro and half-sister to the Dual Smart Rey daughter Iggy Reyzalea $70,080. Iggy Reyzalea and Teles Bout this Cat placed with Hedlund, respectively, in the 2017 and 2010 NCHA Futurity Non-Pro finals. Nadine Payne scored 219 points on Im Not Blu, by Once In A Blu Boon, to earn $9,269 and the Derby Non-Pro reserve championship, while Cade Shepard placed third and earned $7,120 with 218.5 points, aboard Lite Headed, by Light N Lena. Madalyn Colgrove and Sweet Baby Marie, by High Brow CD, scored 222 points in the Classic Non-Pro for $6,906 and the reserve championship. Dustin Adams and Sly Pepto Girl, by One Time Pepto, marked 219 points for third place and $5,320.